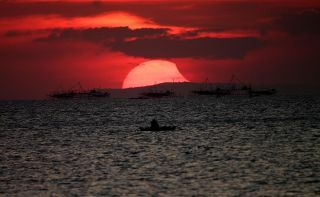 A partial solar eclipse in 2010 as seen above Manila Bay in the Philippines. It isn't safe to look directly at the sun during any eclipse of the sun, and the partial solar eclipse on Thursday is no exception. Even though the moon is passing in front of the start from Earth's perspective, the sun is still incredibly bright and looking directly at it can damage any skywatcher's eyesight. Instead of looking straight at Earth's closest star, observers still interested in seeing the partial eclipse can use a pinhole camera — an easy tool made with household items. You can also use some crafty skills and a pair of binoculars to create a solar eclipse projector for Thursday's event. To do that you'll need: a air of binoculars; a tripod or stack of books, duct tape; scissors; and two pieces of cardboard. You can use our video guide to build a solar eclipse projector with binoculars. Thursday's partial solar eclipse should be visible, weather permitting, to people across a wide swath of North America, and even if you can't catch the eclipse from your part of the world, you can see it live online. The online Slooh Community Observatory will host a live webcast with expert commentary on its website www.slooh.com starting at 5 p.m. EDT (2100 GMT) on Thursday. Another webcast will be hosted by the Griffith Observatory in Los Angeles, California. You can also watch the solar eclipse webcasts live on Space.com. Thursday's solar eclipse could act as a preview for another eclipse that should be visible to people around the United States in 2017, according to one eclipse expert. "This partial eclipse visible to people looking through sun-safe filters on Thursday is a coming attraction for the August 21, 2017, eclipse that will have the moon entirely covering the sun in a 60-mile-wide band across the U.S. from Oregon to South Carolina, with 80 percent or more of the sun covered from most of the continental U.S.," Jay Pasachoff said in a statement. WARNING: Never stare directly at the sun through binoculars, an unprotected telescope or your unaided eye. Serious eye damage can result. Astronomers use protective filters or solar eclipse glasses to safely observe the sun. "The sun is so bright that even through ordinary sunglasses you can damage your eyes if you stare at it," Pasachoff added. "The special solar filters that are available, which are made of a black polymer, block out all but about a thousandth of a percent of the sun's brightness, while ordinary sunglasses would dim the Sun by only a relatively small bit even in the visible while allowing almost all the hazardous infrared to come through." Editor's Note: If you take an amazing skywatching photo of the solar eclipse or any other night sky view you'd like to share for a possible story or image gallery, please contact managingeditor Tariq Malik at spacephotos@space.com.